The geographic conditions and climate in Bulgaria has great influence on the development of the kilim rugs manufactoring. The rich pastures and lush mountain meadows allow breeding sheep, and they give plenty of wool. Because of that, the major material used in the handmade kilim rugs is sheep wool. In the rugs the wool is mostly used for a weft. But it’s possible to be used for the warp, too. For manufacturing kilim rugs is used only high quality wool. There are several steps in preparing the wool for making rugs. After shearing the sheep the wool is being dried and combed. Thorns, splinters and felts which lower its quality and can be a problem for its future treatment, must be removed. After that the wool is ‘dragged’ on a carding-machine or a gill, to be cleaned from tiny adulterants and fluffed on distaff-ful. To be made the yarn, the distaff-ful must be put on distaff and spinned with spindle or spinning-wheel. The priority of the spinning-wheel is not only the faster spinning but twisting of two or more threads, so that the yarn is stronger. The wool is harmless natural material, pleasant and healthy when you touch it. It also keep warm. It’s easy for varnishing and keeps the colors for a really long time. Also in its natural colors the wool can be white, yellow, brown or black. As for the property it’s handy for working with it. It isn’t electrostatic, doesn’t hold and doesn’t attract dust. For the warp is used cotton. 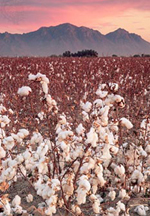 The cotton is natural plant harmless material. It is used for warp because of its good spinning qualities (thin and even fibre), strength and bigger firmness on atmospheric changes. Its elasticity made it good for using as a warp. Moreover, the moths don’t infest it so rugs made with cotton warp have longer life. The cotton treatment is the same as the wool.